Runner beans always grow too many beans. We only have a dozen plants, and yet every summer I’m blanching and freezing huge quantities that we never get round to eating. I’ve even started to think of salting and bottling them (I do bottle French beans – they’re great). Our allotment neighbour said ‘have you ever let them get big and eaten the beans? They’re nice’. We tried it and haven’t looked back. When you can’t face freezing or eating any more of the sliced green variety, just let the rest hang on the vines until they’ve dried. After podding them, I dry the beans thoroughly in a basket near the radiator, store them in a loose-weave sack, and they last all year. Runner beans, soaked and cooked. As big as mice! They need gentling back into life by giving an overnight soak and a quiet simmer. Too harsh a treatment makes the skins blow off. They’re great as a substitute for red kidney beans. I love them in soups; sometimes they are as big as mice and fill the entire spoon – they nearly need carving. 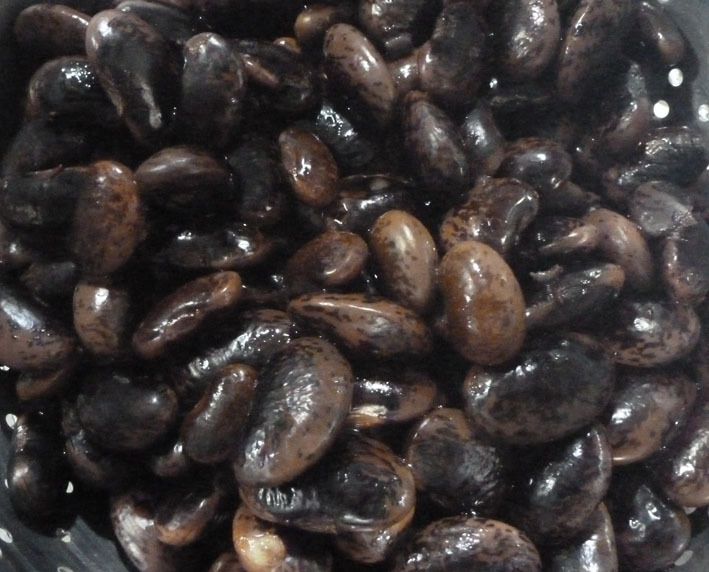 Dried beans (three big handfuls – sorry, forgot to weigh them!) Bring to boil in plenty of water, turn off heat and allow to soak overnight. Change water and simmer gently for about 40 minutes, until soft. Toast for half a minute in the microwave (keep your eye on it) and grind. Fry spices, garlic, carrots and celery until tender(ish). Add cooked beans and stir well to combine. Put crumbs and egg yolk in food processor and combine. Add bean mix and salt to taste. Process until vaguely mixed. (You’re trying to achieve chunky chopped, and some whole, beans suspended in a binding paste, so you don’t want to blend too energetically). Model the result into 4 large burgers, coat with flour and brush lightly with oil. Cook in the oven at 180C for 30 minutes. Meanwhile, fry onions, grill bacon and toast buns. Assembled. Add what you like! Cheese, bacon, fried onions, slice of beetroot, tomato, mayo.... size of mouth is the limit. 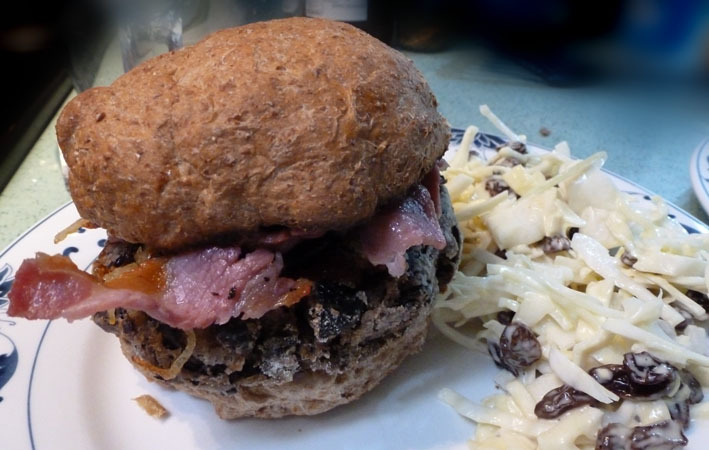 The image shows the burger assembled and served with coleslaw, which I recommend as an accompaniment. Means you’ve had your ‘five a day’ all in the same meal! Cracking.